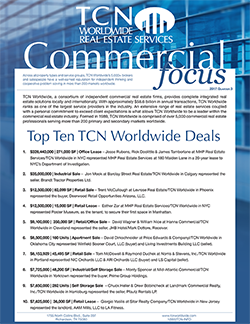 Commercial Focus, Q3 2018: Top TCN Worldwide Member Deals! $37,900,000 | 403,232 SF | Industrial Sale – Jon Mook and Casey Stuart at Barclay Street Real Estate/TCN Worldwide in Calgary represented the seller, I.G. Investment Management Ltd.
$26,500,000 | 89,746 SF | Industrial/Self Storage Sale – Bill Sitar Jr., Thomas Palumbo, John Cranley, and Andrew Burachinsky at Sitar Realty Company/TCN Worldwide in New Jersey represented the buyer, Prime Group Acquisitions LLC. $21,000,000 | 500,000 SF | Office Sale – Ford Price of Price Edwards & Company/TCN Worldwide in Oklahoma City represented the buyer, BancFirst. $10,800,000 | 51,747 SF | Industrial Sale – Jon Mook and Casey Stuart at Barclay Street Real Estate/TCN Worldwide in Calgary represented the seller, Enerflex Ltd.
$9,700,000 | 241,582 SF | Mixed Use Sale – Matt Leonard at Levroses Real Estate/TCN Worldwide in Phoenix represented the seller, Vantage Commercial Properties, Inc.
$8,500,000 | 80,714 SF | Mixed Use Sale, Office/Tech/Warehouse – Fred Hedberg, CCIM, SIOR at Paramount Real Estate Corp./TCN Worldwide in Minneapolis/St. Paul represented the seller, West Bloomington Business Center. $7,268,460 | 15,267 SF | Office Lease – Erik Ulsaker of Long & Foster Commercial Division/TCN Worldwide in Vienna, VA represented the tenant, Global Connections to Employment, Inc.
$6,900,000 | Industrial Sale – Jon Mook and Casey Stuart at Barclay Street Real Estate/TCN Worldwide in Calgary represented Precision Drilling Corporation. $6,250,000 | 9,044 SF | Mixed Use Sale, Industrial/Office – Craig Hansson and Jerry Adamson at Starboard Commercial/TCN Worldwide in San Francisco represented the seller, Richard Teed. $5,600,000 | 37.57 Acres | Land Sale – Giorgio Vasilis at Sitar Realty Company/TCN Worldwide in New Jersey represented the buyer, JG Squarzo LLC. To download the PDF version of TCN Worldwide’s 2018 3rd Quarter Edition of Commercial Focus, click here. $5,358,906 | 41,542 SF | Office Lease – Ben Azulay at Bradford Allen/TCN Worldwide in Chicago represented the tenant, MedSpeed. $4,822,764 | 17,987 SF | Office Lease – Ben Azulay at Bradford Allen/TCN Worldwide in Chicago represented the tenant, GrubHub. $4,725,000 | 47,456 SF | Office Sale – Art Miller at Long & Foster Commercial Division/TCN Worldwide in Vienna, VA represented the buyer. $5,100,000 | 13,760 SF | Retail Sale – Trenton McCullough, Mark Cassell, and Danielle Davis at Levrose Real Estate/TCN Worldwide in Phoenix represented both parties. $5,000,000 | 73,741 SF | Retail Sale – Trenton McCullough, Mark Cassell, and Danielle Davis at Levrose Real Estate/TCN Worldwide in Phoenix represented both parties. $3,379,584 | 28,684 SF | Retail Lease – Greg Slyman, Richard Kelly, Sean Wall, and Tom Grasso at Hanna Commercial/TCN Worldwide in Cleveland represented both parties, Cosmo-Eastgate Ltd. (landlord) and JPMorgan Chase Bank (tenant). $2,700,000 | Retail Sale – Kelly Carver at Barclay Street Real Estate/TCN Worldwide in Calgary represented JICE Investments Ltd.
$2,397,350 | 9,990 SF | Retail Lease – Randy Markowitz and Sean Wall at Hanna Commercial/TCN Worldwide in Cleveland represented the tenant, Oak Street Health MSO, LLC. $4,500,000 | 23,000 SF | Industrial Sale – Erik Ulsaker at Long & Foster Commercial Division/TCN Worldwide in Vienna, VA represented the seller, Blueco, LLC. TCN Worldwide, a consortium of leading independent commercial real estate firms, provides complete integrated real estate solutions locally and internationally. Representing more than 200 markets collectively worldwide, TCN Worldwide member firms are leaders in their respective marketplace and serve as the foundation for our organization’s success. TCN Worldwide ranks as one of the largest service providers in the industry, consisting of more than 5,000 commercial real estate professionals in 160+ offices across 24 countries, and collectively representing more than $58.6 billion in annual transaction volume. For more information, visit www.TCNWorldwide.com. Keep up with TCN Deal Announcements! Follow TCN Worldwide on LinkedIn, Facebook & Twitter!